Your Little Angel is the apple of your eye, but you do not want to spoil him to an extent that he starts taking this gentle behavior from your side for granted. One of the best examples of this scenario is when you allow your pooch to come to your bed and he growls at you. Now this is an unacceptable behavior. While growling is an act that dogs do to convey their discomfort or disapproval it is a good thing that you learn about this thing before it becomes dangerous. Once the growling starts you can rest assured that a snap or bite is on the way. How to deal with Dog growling when asked to get off the bed? So, the best thing that you can do is to prevent the scenario where the doggie feels to growl rather than punishing your furry friend for growling. The best thing that you can do in such a situation is to disallow your tyke to get on the bed. But it is not that easy because your furry friend looks into your eyes and wants to stay there with you and so it is not a straightforward solution. The other alternative is to ignore the growling of the doggie and relax, but personally speaking, it is a little discomforting when your furry friend growls at you that too in your own bed. Either stop the doggie from growling at you in your bed or do not show any concern. It is entirely at your discretion how you want to tackle the situation. But most probably it has been found that dogs growl in beds due to possessiveness or guarding behavior. Never discount the health of your doggie, as he can even growl due to pain. It is always fun when you have a company in your bed, but personally speaking, if your pooch growls at you in your own bed it is important that you lay stringent regulation temporarily wherein your dog should not be allowed to get on any kind of furniture in the house for at least couple of weeks. It is also recommended to have a stringent “invitation only” rule. This means that you take the decision as to when the pooch will be allowed to get on the bed not the other way around. We recommend you to use the “up” command and block or stop the dog from getting on the bed in all circumstances. You can even use a dog crate or a kennel along with closing the bedroom door locked selectively so that your doggie does not get on the bed without your consent. It is very important that you teach your doggie “off” command and then divert his attention from the bed to treats; and train them when to get on the bed through “up” command. If your doggie does not follow your command and jumps up, then calmly block him or use the command “no” and get them off the bed. Never allow frustration or anger to get to you when you command your pooch. Always be serious while giving commands to your tyke. Train the doggie to learn the command “No” by repeating it at least five to six times so that he knows what is expected of him when you say the command. But still if he does not follow the instructions then close the bedroom door, utilize a leash to tether him or put him in a crate so that he can be kept away from your bed. After a short while when you think that your pooch has calmed down command him to come to your bed through “up” command. You can have a blanket or dog bed beside your bed where the pooch is only allowed when you give the “up” command. You can have the area anywhere on the bed, but it is recommended to have it at the foot of the bed. After you give consent to your doggie through “up” command and he gets on the bed and growls immediately ask him to get down through the “off” command. Put a cool hand and calmly put him on the ground without displaying any emotion. The specific reason for not showing any emotion to your doggie is to minimize the tension between both of you. 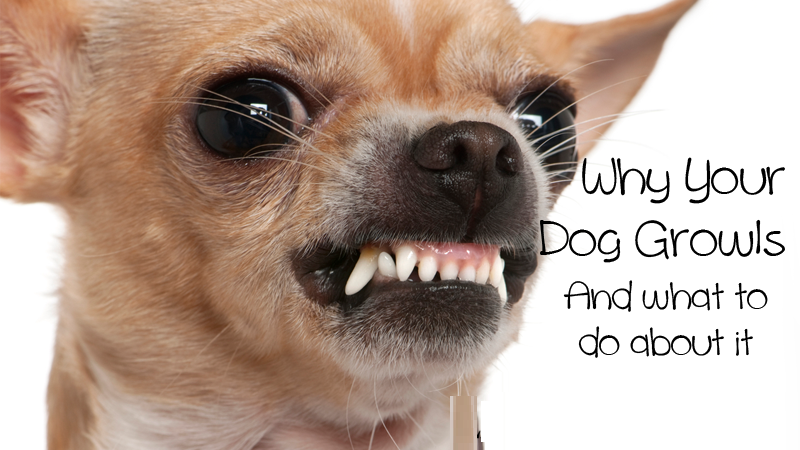 Never ever scold your pooch for growling. Instead, block him when he tries to jump up or put him in a crate in another room. If your doggie growls on the bed, put him in a crate or kennel during the night. This way you can make him realize that growling on the bed is not a good habit. Then after some time when he calms down you can take him to your bedroom and allow him to get in the bed. Remember, he has already lost the privilege of getting in the bed it is just that you are giving him an incentive for good behavior in terms of treat or quality dog supplies depicted by him when he is put of crate or kennel. It is a general saying that “There is no free lunch” and this saying can be applied while training your tyke. Train your dog with treats, playtime and other incentives so that he understands that getting on your bed is a privilege that he needs to earn. Make him learn about the positive aspects of being calm and with a little hard work and training he will learn to associate being calm as a reward for getting on your bed. Remember, your pooch is just like a baby. The more you try to stop them from doing something, the more they will try to do that thing. Just train them and teach them the positive aspects of being calm in the bed. This will go a long way in ensuring that your tyke learns to be calm when he is on your bed. Have you faced a similar situation with your doggie? If yes; post it in the comments section and we would be glad to learn about the different things that you did to calm your pet who knows; we might even publish a blog enumerating your personal experience and giving you due credit for the incident. Till then keep reading!! Are you feeling scared and anxious as your furry friend has puked a bunch of white foam? Lots of questions come in the mind when dealing with this predicament, including: Whether your cat is sick? What precautions you need to take to help her? Is she feeding on your houseplants? But do not panic as it is very common for cats to throw up white foam. If your kitty is young and she does not know when to stop eating, vomiting the white foam is the best resort for her to relieve herself. So don’t worry if this is the case. A frequent change in the cat diet can result in puking white foam. Hence, it is recommended to gradually and slowly introduce new food to your kitty so that she does not encounter any stomach related issues. The cat’s stomach releases gastric acids, biles and hydrochloric acid to assist in digesting food. If she starves for a long time the hydrochloric acid in her stomach builds up causing stomach irritation resulting in throwing up white foam along with yellowish bile. Felines have the habit of swallowing hairs that results in hairball problems which causes throwing up of the foam. Some of the symptoms include: constipation and reduced appetite. Inflammatory bowel disease can cause your feline to suffer in silence from the stomach and gastrointestinal problems resulting in her puking white foam in case unnecessary cells plague the gastrointestinal tract. Some of the symptoms include: loss of appetite, weight loss and diarrhea. The small intestine of the feline gets inflamed, causing this condition. The symptoms include: lack of energy, diarrhea, vomiting and weight loss. The feline might vomit blood, food or bile accompanied by white foamy uniformity. Cats fail to produce enough cortisone as a result of this disease that leads to puking of white foamy substance. This disease can affect mature and young cats but is more common in female kittens. The symptoms include: diarrhea, low blood sugar, depression, lethargy and muscle weakness. We understand that you love your kitty, but are going through a financially crunch situation at the moment hence, cannot afford a veterinarian visit. So, we have enumerated three home remedies that will assist you in overcoming the puking of white foam in felines without paying for expensive treatments to your veterinarian. Avoid giving food to the feline for 24 hours so that the inflammation caused in her stomach reduces significantly. But always have enough fresh water available to the cat throughout the day. When the duration is over, give her bland food like cooked white rice and only after 2 days start with the regular cat food. Stick to the bland diet if the condition does not improve after 3 days. Peppermint tea is a great way to settle upset tummy of cats. So, simply brew up the peppermint tea; let it cool for some time, and then give a teaspoon to your feline after regular intervals to relax her tummy. When your feline licks her fur it leads to constipation resulting in puking so hairball is the major culprit here. The best way to deal with the situation is to add a teaspoon of mineral oil in the main course of the cat’s diet thrice a week. This will prevent constipation and vomiting in your furry friend. We hope that by following these home remedies your kitty gets well soon and lead a very healthy and long life with you!! Lot of times we hear about the heinous act of bullying at school or work. But when your kitty starts to bully other cats in the household it is the worst possible nightmare turning into a reality for a cat owner. If you are ignoring the nasty scratches and bites from the bullying cat to the quieter cat, then it is not an encouraging behavior from your side. It may seem a friendly banter from the aggressive feline, but it can soon turn into an ugly scene which you would not love to see. Remember, it is never humorous when you see one of the cats bullying the other in front of you because it is due to your negligent behavior that the feline has turned into a bully. In the end, the bullying cat becomes so nasty that eventually everyone in the household becomes petrified by their behavior. If you resort to forceful means to correct this behavior, it only makes the situation worse. So how does a cat become a bully? Remember, cats are territorial by nature and through domestication, they have learned to live with each other. No cat is a born bully, although some cats may have more dominating nature than others. A cat becomes a bully when you let them get away with their bad behavior like growling or swiping their claws. If you have multiple cats, then he will try to guard the cat food. He even attacks other felines in the household with a surprise through his teeth and claws. In the worst situations cat owners give up and decide on sending the bullying cat to the shelter. But that is not the best option. The good news is that this bullying behavior of cats can be corrected. Let us look at some of the steps that will assist cat owners to prevent the bullying nature of the kitty. How To Prevent The Bullying Nature Of Cats? The best possible thing to do is to separate the cats and keep them in different rooms. Comfort the kitty that is being bullied and ensure that he is safe from the bullying cat. Keep the bullying cat away from the bullied cat so that he cannot cause more damage to him. If the bullying is mild then the best resort to ease off the tension between the felines is to redirect their attention to cat toys. This will enable the bullying cat to divert his attention from bullying to playing.Alternatively, you may engage them with lucrative stuff of cat supplies and other cat foods or cat nutritious supplement to divert their mind and attention for a while. Note: Playing with the cat toys will not only ease the tension between the two felines, but will also tire them up which would curb the situation from turning worst. Having an escape route for the bullied cat is imperative so that he can hide from the bulling cat. For that you will need ample of space in house, but if you do not have it, then it is recommended to create vertical space with sturdy cat trees having shelves that are not directly above each other. This will enable the bullied cat to easily escape from the cat tree if required. Have a separate access to food, water and litter while confining the cats. If the situation gets worse, the best resort is to reintroduce them as if they have been introduced for the very first after a long gap. Keep in mind, the end objective is to establish a truce between the felines. So, how do you plan to resolve the bullying in cats? Category: Behavior Tags: Aggression Between Cats, Bullying in Cats, Check Cat Behaviour, Conflict Amongst Cats, Is Your Cat A Bully? Your baby and family dog are sitting on the floor and your baby is playing with some toys. You are reading a novel and the next thing you hear is a short rumble of a snarl accompanied by cries of your baby. When you divert your attention you see your baby bitten on the face by your four-legged friend and then a thought flashes in your mind: Why in the hell did the pooch bite my baby? This incident happens quite often in our country. In fact, an independent research conducted estimated that approximately 5 million dog bites every year out which nearly half of them are babies and children. On top of this, further stats prove that two thirds of dog bites amongst children happen on the head and neck requiring plastic surgery in most cases. So what is this thing between babies and dogs which turns these warm and friendly canines into an aggressive beast in front of babies who are not even able to defend themselves? The reason for that is babies are about the same size as a doggie or even smaller than them. But your dog is not intimidated by them as they are not of the same size and stature as you. Hence, in their anxiety and fear your tyke bites babies. Dogs are animals after all and even the best of animal can act in an unpredictable manner due to reasons best known to them. Now, seeing the tyke turned aggressive towards your baby can give you a goose bump for sure and you even think about him giving up as a last resort. But before taking this extreme step, consider what might happen to your four-legged friend if he is sent to the shelter house. Due to previous bad behavior, he may not get another home. In the worst situations, he might be put to rest, which is a very bad thing. So how do you counter the situation? Before the baby is born, prepare your pooch for things to come. Train him to endure future interactions with the baby by poking at his nose with your fingers, tug his ears softly and pull his fur. Once he tolerates the action give him a treat so that he associates the experience without growling as a positive thing. Crawl on the floor as a toddler to accustom your pet about the things to come. Immediately take help of other adults and ensure that the bay is out of reach of the dog. Get the pooch to the other room. Never punish your pooch instead be glad that he expressed his displeasure through a warning instead of a bite. Keep the baby away from the dog all the time. Have baby gates around the house so that your tyke can roam freely. When the baby falls asleep ensure that the room is shut and let the dog hang around with adults under supervision. Consult a behavior specialist to devise a training program. Attend obedience classes to socialize your pooch and prepare them for unforeseen circumstances. Learn these strategies and then apply them on your dog. Once he obeys, give him treats. Understand the body language of the pooch along with the warning signs. Once you understand these cues, it will become much easier to protect your baby from dog bites in the future. Generally, it has been observed that dog owners are concerned about their furry friends putting on excessive weight. Seriously, we all know that obesity in dogs in a major problem in USA. But there are certain dogs that deal with just the opposite of this problem. They are too skinny for their own good. If you are one of the dog owners who have a skinny pal then you have hit the right button as this write-up will provide you the essential tips to assist in gaining healthy weight in your furry friend. It is important to understand that a skinny doggie is as unhealthy as an overweight dog and hence, as a dog owner, you need to ensure that your furry friend reaches their ideal weight so that he remains healthy and fit for their entire lifespan. If the ribs of your furry friend are visible quite clearly then it is a sign that your doggie is going through malnutrition. A healthy dog has a good amount of muscle and fat on his body and so if you do not find it then it is an area of concern. Why dogs lose abnormal weight? The best thing to do in such a situation would be to take him to your veterinarian without any further delay. Bear in mind, your veterinarian is the best person to gauge the reason for the excessive weight loss. He/she will perform a complete diagnosis, including physical examination of your tyke to determine whether any disease or health issue has affected the weight loss along with the appetite of the doggie. Before commencing the weight gain program, it is important to rule out the possibility of disease. If he is suffering from a medical ailment, it is important to get him treated immediately. Then ask your veterinarian for determining a weight goal for your pal. The best piece of advice that you can ever get while commencing a perfect weight gain plan is to create a journal to keep a record of the daily meals, the number of times you provide meals, the exercise regime of your furry friend and his current weight. When you record even the minutest of details it makes your task that much easier when the weight of your pal changes. You can then go back to the record and see the changes in his weight during the period. This is quite useful in the long term. It is important that you select food that increases the nutrition of your doggie rather than simply adding up the calories. If the diet that you provide to your furry friend contains excessive calories; then it can upset the digestive system of your tyke resulting in vomiting and/or diarrhea. If the diet contains too much of fat, then it can result in inflammation of the pancreas. Hence, it is very important to provide a well-balanced and nutritious diet with a balanced proportion of vitamins, minerals, proteins, fats and carbohydrates. You can even give him vegetables, eggs and fruits. Note: Never serve by products, meat meals or cereal grains to your doggie as it can be dangerous for his health. For healthy weight gain it is important that you provide smaller meals 3 to 4 times in a day instead of one or two large meals. This will assist your furry friend to easily digest the food and metabolize the nutrition from the food. When you are transitioning from larger meals to smaller meals ensure that you divide one large meal into smaller meals. This will help you keep a track on the quantity of meal that you are serving to your doggie. With time you can increase the quantity of the meal that you serve, but do so gradually by adding a tiny bit in smaller meals. It is advised to serve four smaller meals in a day, but ensure that there is never a gap of more than 6 years between the smaller meals. It has been observed that food supplements that are available online have all the requisite vitamins and minerals that can assist in increasing the appetite of your skinny pal and encourage him to eat more. It is also advised to let your veterinarian conduct some blood tests that will help them to know whether your furry friend has a deficiency of any substance. If you find that your doggie has a deficiency of vitamins, you can give Fidos Calcium Gluconate to meet all the vitamin requirements of your doggie. If your doggie has been eating dry kibble on a daily basis, it is time to transition from dry to canned food. But make sure that the change needs to be gradual because if done very quickly it can result in digestive problems in dogs. We understand that puppy food is especially for puppies, but since it contains higher calories than adult food which assists puppies to grow faster it is the best thing possible for your skinny pal. The increased calorie in the diet can aid your furry friend to put on healthy weight. It seems to be a bit contradictory, but regular exercise regime also assists in gaining healthy weight in dogs. With the aid of regular exercising your furry friend will be able to build muscles that will add bulk to their skinny bodies. In addition to this, with regular activity your pooch will demand more food to meet their nutritional needs. Always ensure that you increase the exercise duration slowly and gradually when your furry friend starts eating more. Never overdo the exercise activity as it can result in sore muscles which will inflict pain in your furry friend. If you are unsure about the duration of the exercise regime, consult with your veterinarian and then set a routine. The final thing that dog owners usually do to increase the weight of their furry friends is by preparing a treat on their own. Select something that your furry friend enjoys eating. It can be as simple as salmon oil or natural beef stew. Integrate it in the dog food. This will encourage your furry friend to eat more. You can even add wet food in conjunction with dry food to give the best of both the worlds to your doggie. Get ingredients that are rich in fat, and then serve them as a snack to your furry friend. But ensure that you serve only three snacks in a day, because excessive fat is also not good for health. When you make these requisite changes in the diet of your doggie along with the integration of a regular exercise regime, it will assist your furry friend to gain healthy weight in due course of time. Have your veterinarian see the records that you are keeping about your furry pal on a regular basis, so that they can gauge the progress that your pal has made in the weight gain program that you have set for him. So, how did you manage to gain weight of your skinny pal? Let us know your personal experience and we would be glad to know different things that you tried to increase healthy weight of your doggie. We might even post a blog on the basis of your personal experience and give you due credit for it. So what are you waiting for? Post your comments today, and make your doggie famous…..